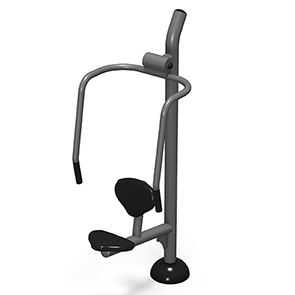 The Chest Press Station is a safe, durable and independent machine to shape the arms and chest. Having a strong upper body allows one to perform daily tasks or other types of exercise with ease and more confidence. With a similar motion to a bench press or push up the chest press is a compound lifting exercise in the sitting position where the weight is pushed away from the body. The isokinetic spring resistance is combined with body resistance which allows users to customize their workouts. Exercises performed on the Chest Press Station allows for the focus on form and technique, all without requiring a spotter. The contoured, ergonomic padded seat, back rest and slip resistant handles provide a comfortable surface to make that the first push to a better self. Improve community health and wellness with the addition outdoor fitness equipment, like the Chest Press Station, to almost any outdoor space—great for parks and along trails. The Chest Press Station is an innovative, all-steel piece of outdoor fitness equipment designed for long term, low impact user friendliness. People of all ages and skill levels have the ability to improve the upper body without heavy weights.